Three lucky monkeys have been rehomed in the beautiful Lakeview Sanctuary in Berkshire, UK. With the care and affection of the dedicated staff, as well as their gourgeous new surroundings, their lives have changed forever. The three macaques, which had been used in neurology experiments at a major European animal research laboratory, were no longer required and were scheduled to die by the end of 2009. The laboratory responded positively when ADI offered to home the animals - and by Christmas they were safe and sound. 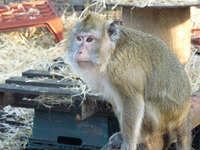 In January 2010 these three lucky monkeys were released into their outdoor quarantine enclosure for the first time. After six months in quarantine they were released into a brand new, and very large, permanent outdoor enclosure, with adjoining nighthouse, in the woodlands of Lakeview Monkey Sanctuary. View the pictures of the 3Bs stepping out into their outdoor quarantine area for the first time. View the pictures of the 3Bs in their purpose built outdoor enclosure.